Venous Insufficiency means the flow of blood through the veins is not efficient, which ultimately causes blood to pool in the legs. This condition can be caused by varying vein disorders, but most caused by either blood clots or varicose veins. 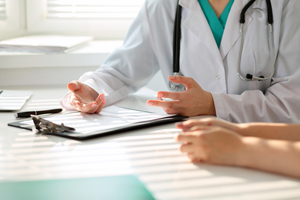 The treatment options for Venous Insufficiency includes compression stockings, prescription medications, and in some cases, surgery to allow your blood to flow more smoothly. This condition is a blood clot that has formed inside of a vein, often deep within the leg. Deep Vein Thrombosis, or DVT, can be dangerous if the clot breaks off and travels through your bloodstream. It could get stuck in your lungs and block your blood flow, which causes organ damage or even death. A common symptom of DVT is swelling below the knee, as well as redness or pain in the same area. Sometimes, no symptoms occur. Surgeries, injuries, and your immune system can all cause DVT, as well as thick or slow flowing blood. When a vein is dilated or its valves are damaged, blood moves in the wrong direction. It leaks down the leg vein and “backs up.” This can cause the leg to ache and swell, feel tired, heavy, or full. Problems with the saphenous veins can harm the side veins that drain into them, causing the smaller veins to dilate and become varicose too. 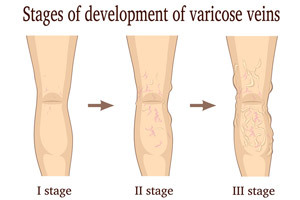 Varicose veins can cause bleeding, changes in skin color, and ulcers. 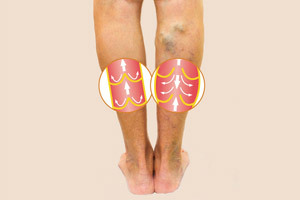 If blood clots in a varicose vein, the vein walls can become inflamed (superficial thrombophlebitis). Sudden pain, redness, or swelling in the affected area may result. When tiny blood vessels just below the skin's surface dilate, they can be seen easily. Clusters of spider veins can even look like a bruise. 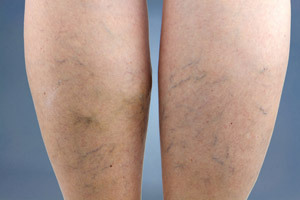 Spider veins can form due to heredity, injury, pregnancy, or hormonal changes. These veins are generally not harmful, but their appearance can make you self-conscious. In rare cases, these vessels can bleed, causing more serious problems. To schedule an appointment for vein care, contact us at Vein & Laser Center today!